Three Parts Whole features new work by noted Icelandic artists Finnbogi Pétursson, Hrafnkell Sigurdsson, and ívar Valgardsson. The work is diverse, and is meant to be so. Pétursson’s suspended video camera swinging like a pendulum as it briefly displays its own “view” on a monitor, as well as his time-based drawing on the wall; Sigurdsson’s enthralling photographs of sculpture-like chunks of ice and snow fallen from automobiles and his photographic construction displaying distant mountains, the sky, and an exploding volcano; and Valgardsson’s spare yet captivating wall works made of aluminum, along with a large crumpled ball fashioned from a single sheet of paper painted blue, reveal distinct, highly idiosyncratic artistic sensibilities. These distinct sensibilities cohere in an exhibition full of correspondences, some obvious, and others much more subtle. Related colors, shapes, textures, and motion (whether actual or implicit) course through the exhibition. Compact and contained works suggest distances and immensities: the sky, horizon lines, land formation and convulsion, the ceaseless rhythm of waves. Works dealing in physicality, tactility, and optical power are also marvelously evocative, and able to induce rapt contemplation. On one level a celebration of pure visual pleasure, Three Parts Whole also celebrates the multifaceted “conversation” that develops between the participating artists. This exhibition also has an unusual history. Several months ago Börkur Arnarson from i8 Gallery contacted me with a novel proposal. He was interested in a three-person show of Finnbogi Pétursson, Hrafnkell Sigurdsson, and ívar Valgardsson, and wanted an outside curator to look freshly at their work, and figure out how that work might not only fit, but also thrive, in the same exhibition. I readily agreed, and decided early in the process to opt for new work: my “fresh approach” would engage fresh and untested works. 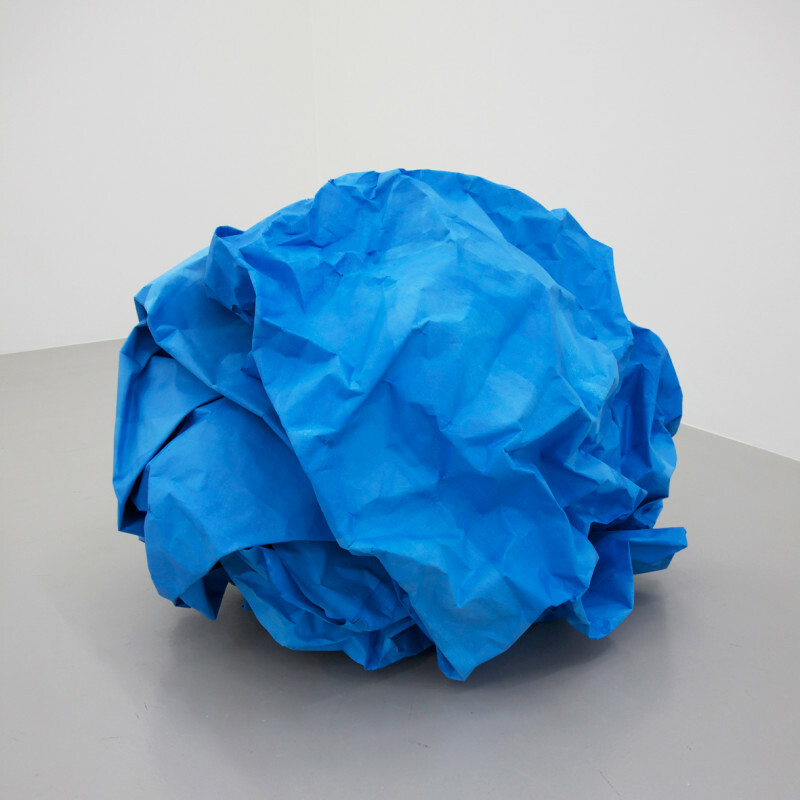 Among a number of “imaginary” works by ívar Valgardsson (explorative virtual works, rendered in Photoshop, that may or may not eventually be realized) I was struck by a large, ungainly, yet oddly elegant blue ball, which suggested both a big rock and a crumpled piece of paper tossed into a waste basket. Valgardsson has now realized that sculpture for this exhibition, and it has a peculiar power and mysterious presence, with its vibrant color, pronounced surface tactility, numerous indentations and depths, and conflation of inside and outside, including suggestions of water and sky. That ball-like sculpture connects—not overtly, but instead subtly and poetically—with Finnbogi Pétursson’s wall drawing for which he used a motorized pen called a SpyroGyro to make an undulating mesh of circular lines, airy and spare in parts, and in other parts much more dense and impacted. Pétursson’s drawing suggests reverberating sound waves (this from an artist famous for working with sound) and also hints at horizon lines and distant geological formations. Hrafnkell Sigurdsson photographs of ice and snow fallen from cars have a surprising sculptural complexity, while pronounced, yet subdued, color tones make them seem almost painterly. In the meantime, Sigurdsson’s nine photographs of icy debris also suggest a horizon line, and an eventful landscape stretching far off into the distance. Sigurdsson is also exhibiting a doctored and mediated photo construction, concerning the hyper-mediated Eyjafjallajökull volcanic eruption of 2010, in which a seemingly serene shot of snowy mountains and a blue sky (the whole image has been manipulated by the artist) can be opened to reveal stupendous billowing smoke as captured in a stock photograph. Call it a window of sorts, a faux window that reveals a stylized volcanic eruption, a manipulated view of a geological event that quickly turned into a global media frenzy, and it is one of numerous nature-culture collisions in the exhibition. Still, Sigurdsson’s manipulated work is majestic, awe-inspiring, and transportive, and retains an aura of a nature-based sublime. Speaking of nature-culture collisions, ívar Valgardsson has enlisted a common building material (corrugated aluminum) for his gray and blue wall works. Diverting this common material into a new context, his concrete works seem curiously vast: rigid pieces of metal that suggest distant horizons, rolling waves, the gray weather that often buffets Iceland, a deep blue sky, the reverie one sometimes feels looking up at the heavens. Implicit motion and pent energy abound in this exhibition, in contained works that also seem really open and alert to powerful, world-shaping forces. Motion becomes explicit in Finnbogi Pétursson’s swinging video camera, rhythmically arcing from one side of the room to the other, over and over, while intermittently displaying what it “sees” on a monitor as sharp yet fleeting visual events. Pétursson’s swinging camera suggests a grandfather clock from the old days, mechanically swinging and swinging and keeping track of the time, but it has many more connotations as well. Most of what it sees and experiences is hidden, but some of what it sees suddenly comes into focus: flash insights, quick clarity, sudden illumination. This back and forth pendulum motion is restless and agitated, but also hypnotic and oddly comforting, suggesting rhythms of departure and arrival, exploration and return. As the tide advances on one shore it withdraws from another, only to later reverse course. As one civilization flourishes another declines, but that too will change in due time. A child’s seesawing day swings many times between happiness and despair. The stock market rises and investors are thrilled but then the bottom drops out and investors get walloped. Optimistic new governments promising reform come into power, but then lose their way amidst compromise and corruption. One’s own most incandescent breakthroughs are inevitably followed by enervation and confusion, but there will be more breakthroughs later. Pétursson’s work is elemental, but also visually and humanly complex, and the same goes for the other works in this exhibition. For me, as the curator, it has been a special pleasure and an inspiration working with these three artists on the development and completion of the exhibition Three Parts Whole.